MacNeil Lyons is a private tour guide and founder at Yellowstone Insight in Gardiner, Montana. Year-round, he escorts small groups through Yellowstone National Park. He also is a published writer, photographer and naturalist. During a recent media trip hosted by Yellowstone Country Montana, MacNeil was our guide for a day. He provides a lavish picnic breakfast, but bring your own eco-friendly water container. His pet peeve is one-use plastic bottles. Tower Fall waterfall plunges 132 feet between jagged pinnacles. 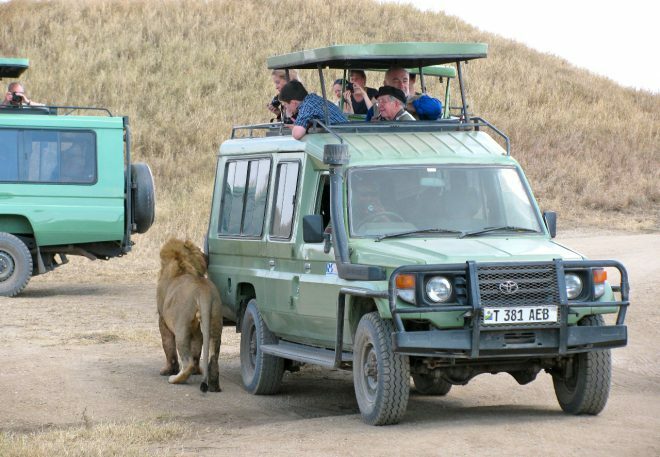 MacNeil Lyons: I provide small guided tours for up to six people through the park, mostly on the northern and central parts. The tours usually last six to eight hours, year-round. To have the best chance of seeing wildlife, we start very early in the morning. We travel in a fully-loaded 2015 Chevy Suburban with heated leather seats. Most people ask about the wildlife tours, but we also have geology tours, where we focus on the park’s amazing hot spots. There are more than 10,000 thermal features: hot springs, mud pots, geysers and fumaroles. We also do history tours and photography tours. Q: What types of wildlife do you typically see? ML: The easiest thing to see is bison and then elk. Most of the prey species are larger in number, so they are easier to find. The predator animals–wolves and bears and mountain lions–are more rare. But every day is different, and you never know what you’ll find. One of Yellowstone’s great bison munches contentedly. Q: Why is the history of Yellowstone significant? ML: Yellowstone became a national park in 1872 when President Ulysses S. Grant signed the Yellowstone National Park Protection Act into law. The history I like to work into my tours is well before that. Twenty-six tribes of Native Americans were associated with the park for about 10,000 years before Yellowstone was even considered as a national park. Then you had the mountain men and early government-funded expeditions and the U.S. Cavalry, who first guarded the park. Some of those early Ft. Yellowstone buildings are in existence today. There’s a lot of cultural history mixed into this one location. Tour guide MacNeil Lyons spread out a scrumptious picnic brunch. Q: How did you get into the business of guiding at Yellowstone? ML: I grew up in my younger years in Boulder, CO, and have childhood memories of being here as a 6-year-old and fishing and hiking and car-camping with Mom and Dad and Grandma. My father gave me a love of nature and open country. When we moved to the eastern shore of Maryland for my high school years, I had a strong urge to come back west. I graduated in 1997 from West Virginia University with a bachelor’s degree in recreation and parks management with an emphasis in natural resources. My first internship was with the National Park Service in California, and I started building my resume at different park sites. Over the course of different jobs, I kept applying to Yellowstone. Then a supervisor offered me temporary work as an interpretive ranger. Because of funding, it’s very difficult to get a permanent position. When my time was up, I didn’t want to leave Yellowstone, so I went into the nonprofit world here in Gardiner. I joined Yellowstone Forever, then called the Yellowstone Association, the nonprofit education partner of the National Park Service. That experience showed me that educating others worked for me, and I was able to dovetail that experience into the private sector. I went on my own and founded Yellowstone Insight as a private guide service in 2015. Dragon’s Mouth Springs in Yellowstone’s Mud Volcano Area belches stinky sulfuric gasses. Q: What’s interesting about Gardiner? ML: Gardiner is quirky in the sense that it is a small unincorporated Montana town that has always been a transient community. That’s mostly based on tourism because Gardiner is a gateway to a national park, so you have seasonal workers. There’s no real oversight in zoning, so you have a a hodge-podge mix of residents and businesses. But Gardiner is important because of the five Yellowstone entrances, this one gives you the most access. The greatest concentration of wildlife is in the northern regions of the park, and the Gardiner entrance is the only one open to wheeled vehicles throughout the winter. Cooke City entrance is also open, but Cooke City itself is closed off. Q: What can visitors expect to see in Yellowstone during the winter? ML: From Gardiner, you can get access to Mammoth Hot Springs for your geology, Fort Yellowstone for some of your history, and the entire Northern Range for your abundant concentration of wildlife. The Northern Range Road from Gardiner to Cooke City is open for wheeled vehicles year-round. MacNeil Lyons, private guide and founder at Yellowstone Insight, Gardiner, Montana. Q: What philosophy guides you in your business? ML: My father always told me to find a job I can go to with a smile on my face, or it’s not worth it. I found an avenue I really appreciate. It’s always different. Different guests I have every day ask different questions, and the level of enthusiasm they have is usually pretty high. Everyone is in a happy mood, which keeps me in a happy mood. Q: What’s the one thing visitors should pack for a Yellowstone visit? ML: Extra clothes. The weather can change in a couple of minutes, so dress in layers. Even in the summertime, it can be 27 degrees Fahrenheit in Hayden Valley or Lamar Valley in the morning and 90 degrees in Gardiner in the afternoon. Learned more about private tours by Yellowstone Insight here. This entry was tagged Montana, nature, park, TALKING, wildlife, Yellowstone. Bookmark the permalink. Six of us took two tours with Macneil and loved every minute. It was a couple of years ago, but I still think about it. He knew so much about the Park and the animals. Don’t visit the Park without taking at least one of his tours. You will learn so much and enjoy the breakfast and nature at it’s best.